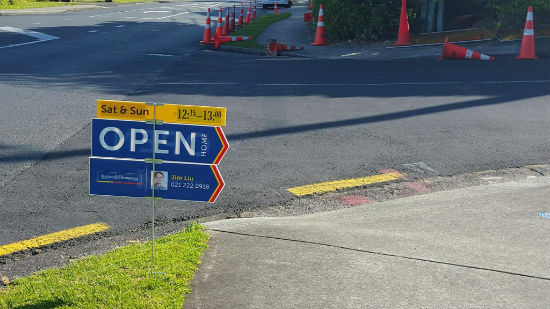 As national house prices are easing slightly, house hunters in Auckland, Northland, Waikato and Southland are facing record-high prices, new data shows. In October, the national median price decreased to $510,000 (from $515,000) but Auckland house prices have increased by $43,000 up to $868,000, according to the latest Real Estate Institute of New Zealand figures. Median house prices refer to the average prices of houses sold on the market. Auckland house prices have surged by a total $119,750 in the past year. But it’s not just the City of Sails to see a spike in house prices. 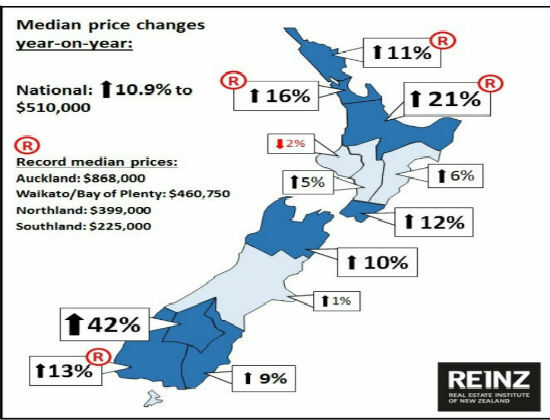 Northland, Waikato/Bay of Plenty and Southland all reached record-high median prices in October, compared with September. Northland has increased to $399,000 (from $390,000) and Waikato/Bay of Plenty has increased to $460,750 (from $458,000). 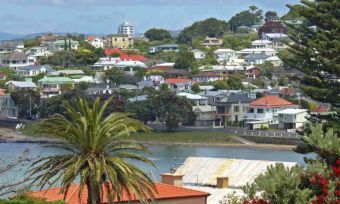 Southland reached $225,000; the region’s house prices haven’t been that high since January 2008. In the face of these increases, sales volumes are down. There were 6727 properties sold in October, a 9% decrease compared with the previous year. Compared to October 2015, sales volumes nationally fell 14%, Auckland by 16% and Waikato/Bay of Plenty by a considerable 25%. “Auckland experienced a lot of strength in the upper end of the market but the lower end appears to be wavering due to the impact of LVRs,” REINZ spokesperson Bryan Thompson says in a media release. As of 1 October, property investors need a 40% deposit in order to get a loan and owner-occupiers generally need a 20% deposit in order to secure a loan. “Our data suggests that the impact of the of the revised LVR rules is having more of an impact on lower-priced sales compared to higher priced sales, with a surge in the percentage of sales over $1 million and a noticeable decline in the number of sales below $400,000 compared to 12 months ago,” Mr Thompson says. In the year-ending October 2016, the number of homes sold for more than $1 million increased by 22% to 977 – almost 15% of all dwellings sold. The number of properties sold for less than $600,000 decreased by 1216 for the year-ending October 2016, compared to a decrease of 1111 of all properties sold in this same period. However, this change could also reflect a general increase in prices over the past year, with the market for higher-priced properties continuing as normal and the lower-priced market getting more difficult for buyers and sellers, he says. 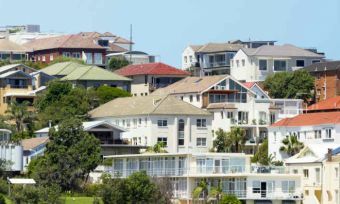 And house hunters are battling it out across a much smaller pool of properties, with owners presumed to be holding back from selling while they suss out the market. According to realestate.co.nz, the number of properties for sale has dropped by around 7400 over the past year. “There is some evidence that normal spring ‘bounce’ in the number of listings has so far been quite weak this year. “One possible reason for this is that the revised rules could be making it harder for people to know whether to sell, as they wonder if there are buyers about, so they hold their properties back from the market. Wellington has the fewest properties for sale with six weeks of supply, Hawke’s Bay with just less than 10 weeks supply, and Otago and Nelson/Marlborough with 11 weeks supply.